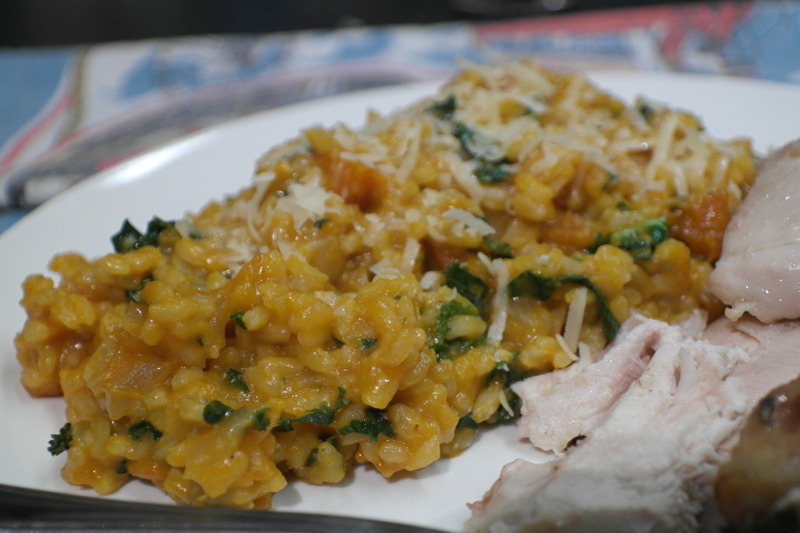 My new love of kale and stodge rice came together recently in this delicious and creamy pumpkin and kale risotto. Preheat the oven to 180 degrees on ‘normal bake’. 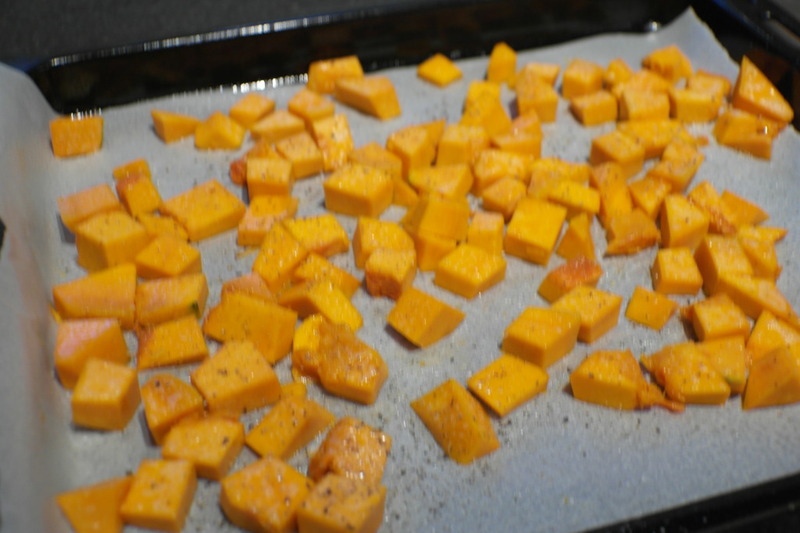 Roast 150g of pumpkin: Line a roasting dish or baking sheet with baking paper. Place the 150g of small diced pumpkin on the baking paper. Roast the pumpkin for 25-30 minutes until it is soft and golden brown. Set aside. Make the pumpkin puree: In a large frying pan or pot, heat 2 tablespoons of olive oil and 2 tablespoons of butter over a medium heat. 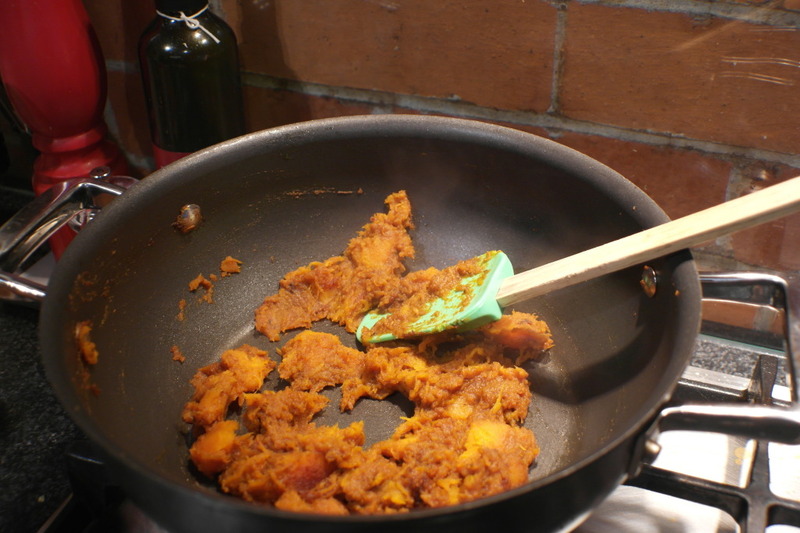 Add the 350g of roughly chopped pumpkin. Sweat the pumpkin until it breaks down completely. I kept adding a couple of tablespoons of water at a time to aid this sweating process. When it’s ready you’ll be able to break it down completely with the back of a spatula. Remove from the heat and leave the puree to one side: It’s time to move onto making the risotto! Heat the stock in a large saucepan. Bring this to a gentle simmer. In a separate (large) large saucepan heat 2 tablespoons of olive oil. Add the onion, celery and garlic and fry slowly for about 4 minutes. When the vegetables have softened, add the rice and turn the heat up to fry the rice. After a minute or two it will go from white to translucent. Add the wine when the rice is translucent and keep stirring. This process evaporates the alcohol and will leave the rice with a beautiful flavour. Once the wine has been absorbed into the rice, add your first ladle of stock and a big pinch of salt. Turn the heat down to a moderate simmer so the rice cooks evenly. Keep adding one ladlenof stock at a time, stirring continuously. Make sure each ladle of stock is absorbed before you add the next one. Repeat this process until all the stock is added (this will take 12-15 minutes). Taste the rice towards the end of this process (i.e. before you’ve used up all the stock) to see if it’s cooked. You want the rice soft, but still with a bit of a bite to it. It goes without saying to adjust the seasoning at this point, right? Once you are done with the stock, add the kale, pumpkin puree, roasted pumpkin, 25g butter, Parmesan cheese. Stir vigorously. Done! Serve, garnish with extra grated Parmesan cheese and pumpkin seeds (I ran out :(forgot to do this!) and some more freshly grated Parmesan. I served this with a big juicy roast chicken and – damn. It was good.